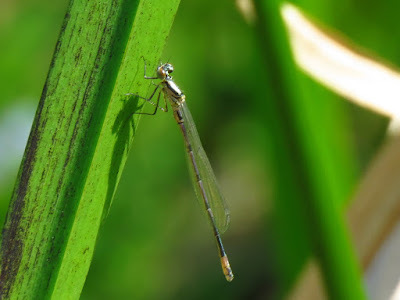 On Monday, I went to my local wildlife garden to check on dragonflies and damselflies. There were only Azure damselflies, Coenagrion puella. The Azure Damselfly is a common species, frequent in small ponds. Males are blue and black and females greenish and black. 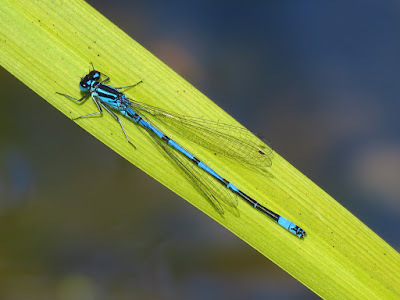 It can be distinguished from the Common Blue Damselfly by a forward pointing sput on the sides of the thorax. I walked around the pond and counted three mating pairs in tandem, and many individuals, including two teneral ones - just emerged and still not showing their full colour. The females were egg laying, with the males clinging to their thorax, guarding them as they lay from the attentions of other males. The females insert their eggs into stems of submerged aquatic plants. Females can lay over 4,000 eggs in their lifetime. 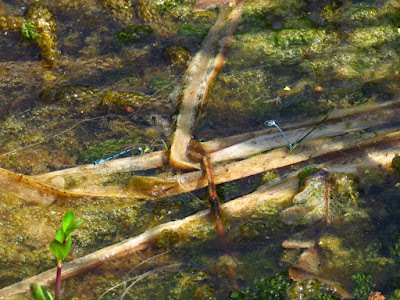 I noticed that the pairs were not randomly assorted around the pond, but tended to gather in the same spot (top shot). Indeed, ingenious field experiments by A Martens showed that this species form aggregations to oviposit, the pairs particularly attracted to the vertical posture of the male in a tandem. Pinned models of a male in vertical position attracted tandems, but pinned models of females did not. Two model tandems were more attractive to pairs than single tandems, which will start an aggregation. A teneral male, recently emerged. 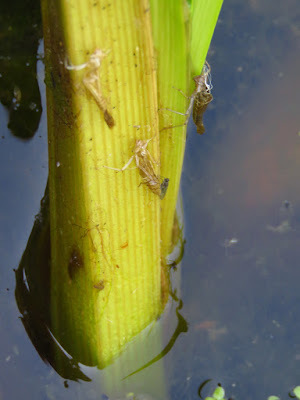 The exuviae of three damselflies still stuck to the stem of a plant. Martens, A. 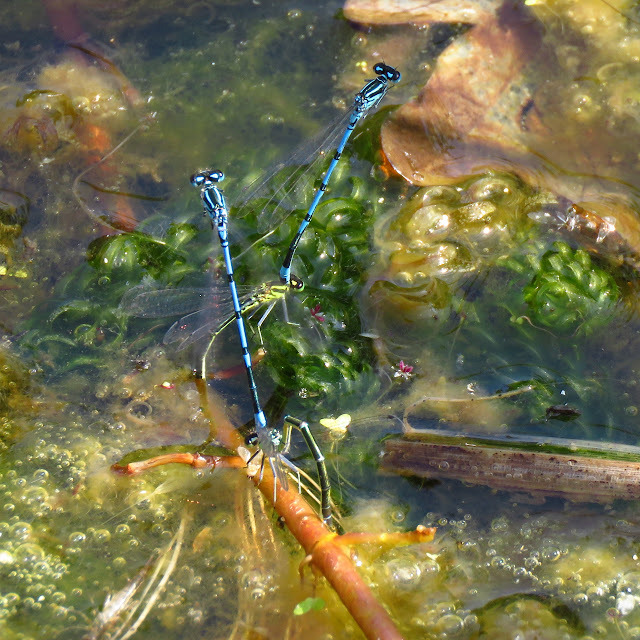 Field experiments on aggregation behaviour and oviposition in Coenagrion puella (L.)(Zygoptera: Coenagrionidae). Advances in odonatology 6, 49–58 (1994).